Peachification, in Japanese Piichi-hime-ka ピーチ姫化, literally "turning into Princess Peach," is the term for turning characters into Princess Peach-like characters by putting a Super Crown on them. Also spelled peachfication or peach-fication. 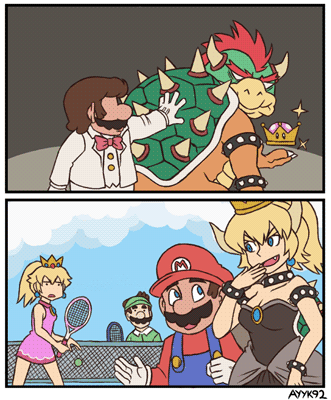 See Bowsette and Other Princesses for reference. Peachification overlaps with rule 63, or "gender-swap (to female)," nyotaika 女体化, and "turning something into a cute anime girl," moe anthropormophism, and, since Super Mario characters are game monsters, it overlaps with monster girls too.